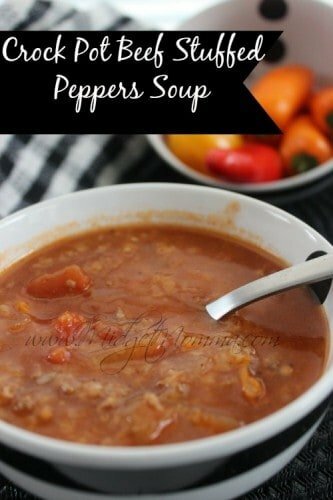 If you love soup and you love stuffed peppers then this crock pot soup is perfect to add into your meal rotation! Combining the easy of crockpot cooking, with the delicious taste of stuffed peppers with the love of soup this Crock Pot Beef Stuffed Peppers Soup is perfect for a winter day or a day you just want to take off from slaving in the kitchen at dinner time! If you are going to be putting this all in your crockpot in the morning getting it all prepped the night before when you are already going to be doing dishes and clean up makes putting this in your crock pot in the morning even easier. All you have to do is Brown the Ground Beef and drain the grease off. Chop your veggies and then add everything into your crockpot. Cook on low for 8-10 hours and serve with bread and salad.